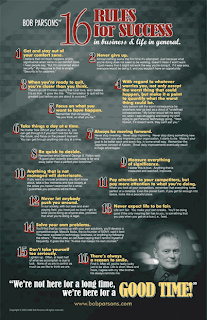 Bob Parsons credits 16 rules for propelling him from humble youth to his role today as CEO and Founder of GoDaddy.com. Now he's making those same rules available to you for display in your home or office. Available in three sizes, Bob's "16 Rules" were the source for many of his successes and can provide inspiration for a variety of circumstances in your life - today, tomorrow and for years to come. You can Get your "16 Rules" poster here .